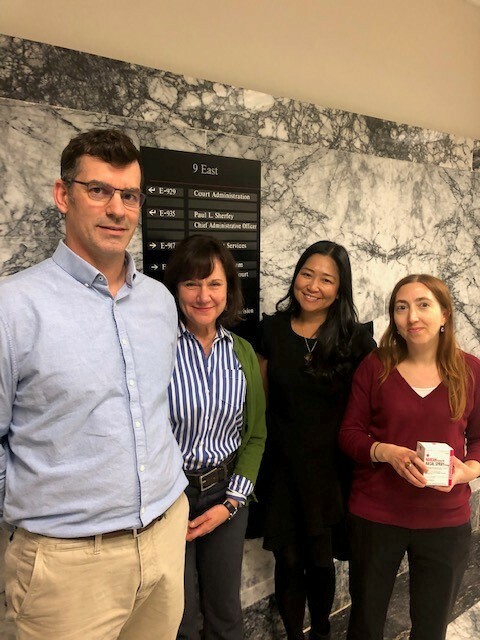 Pictured: Left to right, Adult Drug Diversion Court employees Tom Essex, Mary Taylor, Yuka Hayashi, and Christina Mason. King County’s Adult Drug Diversion Court (Drug Court) is a nationally recognized program implemented in 1994. The program supports our community by providing treatment and other ancillary services under the auspices of the Court to eligible defendants with the goal of rehabilitation and empowerment. Drug Court has saved lives both figuratively and literally with Wednesday, April 3, being no exception. After taking two doses of methadone and recognizing a potential overdose, a participant knocked on Drug Court’s door seeking help. This program traditionally helps save lives over the course of many months, working with participants to help them achieve long-term results. Luckily for this participant, knocking on Drug Court’s door on Wednesday, our program had several amazing staff whose vision for the program also included providing immediate support services. Tom Essex, Christina Mason, and Yuka Hayashi responded to this client in a way that truly makes DJA proud. These three professionals were able to handle the situation by responding calmly and respectfully but also with a sense of urgency and agency. From directly interacting with our participant, contacting emergency medical services, and having to administer Narcan – twice – this was not a typical day for Drug Court, but thankfully these three are not your typical employees. Thank you so much to Tom, Yuka, and Christina. While we hope this type of situation doesn’t happen again, it is of great comfort knowing we have staff that can rise to the occasion. It started as a typical day with drug court clients sitting outside the King County Courthouse (Seattle) 9th floor courtroom, waiting for the doors to open. From the inside, Drug Court employee Yuka Hayashi heard a knock. Here’s what happened when she answered. Listen here.